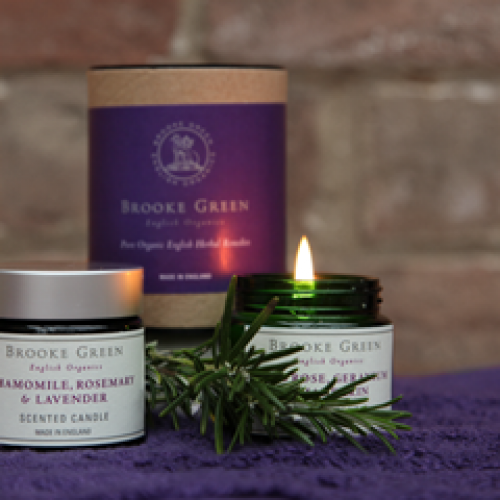 This travel-size candle comes wrapped in tissue in the distinctive Brooke Green cardboard tub. Gently fragranced with herbal chamomile, rosemary and lavender, it manages to be soothing and stimulating at the same time. This candle is a great stress reliever and makes a good background fragrance all year round. Can be used in any room in the house, but after a difficult day try in the bathroom with a few drops of matching essential oil in your bath. Presented in a glass jar with lid - ideal for travelling. Refined mineral wax (candle base), Rosmarinus officinalis (Rosemary) Leaf Oil*, Lavandula angustifolia (Lavender) Flower Oil*, Anthemis nobilis (Chamomile) Flower Oil*, Linalool, Limonene, Geraniol, Citronellol. Brooke Green English Organics fresh tinctures, soaps, creams and oils are all made using the finest quality organic ingredients, grown on their family farm in the heart of the English countryside. Once the ingredients have been harvested, they are processed on-site, overseen by a qualified Medical Herbalist. All products are grown, processed, formulated and bottled in England. Any products not directly produced on the farm are made locally using their own herbal contents and the finest natural ingredients. Brooke Green Remedies are Certified Organic to Gold Standard by the Soil Association.